This pleasant hotel combines a comfort of well appointed accommodation and facilities in a quiet part of the resort, which makes it a great residence for a summer holiday. The sandy beach is some 200 metres away. Basic facilities in room however quite close to main strip and bars, restaurants and food courts. Breakfast was not the greatest but main menu was fantastic in the evening which we used a couple of times during our stay. Cleaner tended room daily and supplied fresh towels. What made the holiday extra special were the staff in the hotel, all quite young and very friendly. I think overall they went out of their way for us and were very welcoming even helping us to learn a bit of bulgarian on our stay! There is a bar open for guests which stays open until the last guest leaves but no noise from the bar on our stay and a mixed group of tourist ages and nationalities which made some intersting conversation! Overall I think the whole stay was very good and would go back. Stayed in the Hotel Amaris Sunny Beach,Cleaners were in the room everyday towels changed twice a week and sheets once,room was small but it had a large balcony which made up for it, luckily on a B&B basis as the breakfast was dreadful no hot food and all the food laid out uncovered on a table the flies had a field day. This is not a family friendly hotel as the majority of it's clients are groups of young lads and girls mainly Swedish/Danish/German who tended to be rowdy. Pool bar is open until the last person leaves which during my stay was about 5am. The majority of the staff in the hotel were young and inexperienced and they found it difficult to deal with problems and on some occasions they were rude. Location of hotel was good a 5min walk from the busy centre. 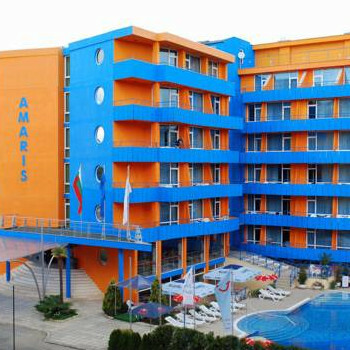 Stayed at the Amaris end of July 2006, hotel is bright orange/blue, and from rear entrance I thought oh no. But, the hotel entrance and rooms are very clean and adequate, rooms cleaned daily, couldn't really fault it, obviously there are better hotels but it didn't disappoint at all really. Quite a good location, out of hustle and bustle, but only a very short walk to centre and to beach 5 Min's. Only stayed b & b, breakfast was continental and plenty of it unless you arrived later on, food was fine, no probs. Pool very clean, though not a massive amount of beds. only downside was that hotel guests predominately Swedish, which is not a prob, but was quite a few large group of lads from there, took over place at times. A must for restaurant is DJ dannys near the market place, it is very good and cheap with it, but beware queues are massive all night this time of year, worth it though, order the big bread its superb with meal. Still on the whole the hotel is OK.
Hotel had only been opened 4 months. Very clean rooms. Bed linen, towels and room cleaned every day beware of floor in bath room very slippy when wet. I really liked my stay in the Amaris hotel, on first impressions I was shocked at the colours but infact when you get used to them there not so bad. The rooms were very clean had no problems there. Food could have been improved. Staff were friendly pool was clean. Nothing bad to say really great hotel would definitely return!